This song is variously entitled Bruach Dhún Réimhe and Mairgne fá Chaisleán na Glasdromainne. This song expresses a poignant lament for the downfall of the Ó Néill chieftain castle which was built on the edge of Dunreavy wood on the shores of Glasdrumman Lake in south Armagh. Glasdrumman Lake, County Armagh – site of O’Neill castle. There are only fragmentary traces of this great castle in the stony ground above the tranquil waters of Glasdrumman Lake. There was once, reputedly, an unusual white ﬂower growing around the rock, where the castle had stood, called ‘Ó Néill’s flower’ which, according to tradition, was originally transplanted from Spain. The song was written during a storm when the poet was taking shelter there, in the ruins of Glasdrumman Castle. A song thrush rises near him, symbolizing the waning spirit of the Ó Néill, and the song is written as an address to the bird. The Ó Néill clan had gone to Spain where they had sought ‘noble recognition’ from the court of Spain, and only their ancestors’ bones remained in Creggan. The burial place of the O’Neill of the Fews chieftains in Creggan graveyard near Crossmaglen County Armagh. Glasdrumman castle was built on the extreme southern borders of the country belonging to the Ó Neill chieftains. From this castle there is a clear view of Dundalk bay about eight miles away and of Roche Castle or Dún na nGall (The Fort of the English), as it was locally called. Roche Castle stood on the far northern borders of the Pale, which was under English rule. Roche has survived in stone, while Glasdrumman, the main castle on the southern-most border of Ó Néill land, is remembered in song. 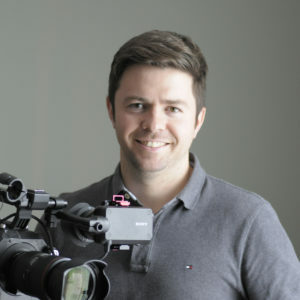 The collector Lorcán Ó Muirí (AHU pp. 358-60) regarded this as Art Mac Cumhaigh’s most melodious song. His poems cannot be disassociated from the history of the Ó Néill of the Fews. Mac Cumhaigh dreamed of the restoration of their power and their patronage. His songs which survived in manuscript and in the songs of the people, helped to keep the traditions of the Ó Néills of Glasdrumman, Dunreavy and Creggan alive in the people’s imagination. His poems leave a wealth of historical references and in them he brooded continuously over the loss of the O’Neills and the loss of their patronage. The castle was built towards the end of the sixteenth century. It was badly damaged in the 1641 wars, and Eoghan Ó Néill lost possession of it in 1655. A Cromwellian called Thomas Ball in 1711 later occupied it. A local man, called Patrick Murphy, who had leased it, then caused its ﬁnal destruction by destroying it, and ‘obliged his masters by pulling down the ﬁve century old castle’. Local tradition has it that he used the stones to build a house and a road nearby. The words and music were written down in tonic solfa from singer Mrs Mary Harvessey, (AHU pp 391-2) from Clonalig, near Crossmaglen, County Armagh, She was born around 1830 (57 years after the poet’s Art Mac Cumhaigh’s death) . She was the main source of songs written by this celebrated poet (AHUpp. 350-1; pp. 250-84) whose songs were very popular in the songs of the people of Oriel. Her daughter Mary on right in the photograph was recorded reciting a few verses by Wilhelm Doegan (AHU pp. 386-7) in 1931. Her mother Mrs Mary Harvessy, Máire Uí Arbhasaigh claimed kinship with the poet on her father’s side. 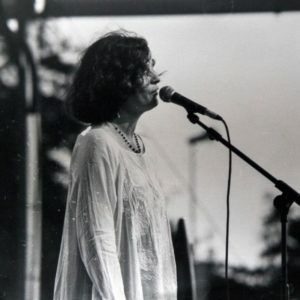 She had learned her songs from her mother and grandmother, which included at least four songs by Mac Cumhaigh. It is likely that her version came directly down from the poet himself, who died in 1773. Traditional singer, Eithne Ní Uallacháin recorded it on her first Gael Linn CD Cosa gan Bhróga, under the title of Bruach Dhún Réímhe. Eithne’s version was later recorded by Donegal traditional singer, Mairéad Ní Mhaonaigh. Feilimí first learned this song from his mother, Eithne Ní Uallacháin. She sings it her with keyboard accompaniment from Jim Corr. Bruach Dhún Réimhe: Eithne Ní Uallacháin COSA GAN BHRÓGA CD ©Gael Linn le caoinchead. Aige bruach Dhún Réimhe: Amhráin Chúige Uladh 1927,23, from Mary Harvessy, Crossmaglen. Mairgneach faoi Chaisleán na Glasdromainne: T. Ó Fiaich, Art Mac Cumhaigh – Dánta (1973, 79 (9 verses). Mairgne fá chaisleán na Glasdromainne: B. Ó Buachalla, Nua Dhuanaire 1976, 39 (9 verses). Le gruaim gur éag na cágaibh. A bhí ’triall ar Ghaeil an lá sin? ’Na gcuail ar thaobh na trágha. Go dún na gcraobh is na fáilte. 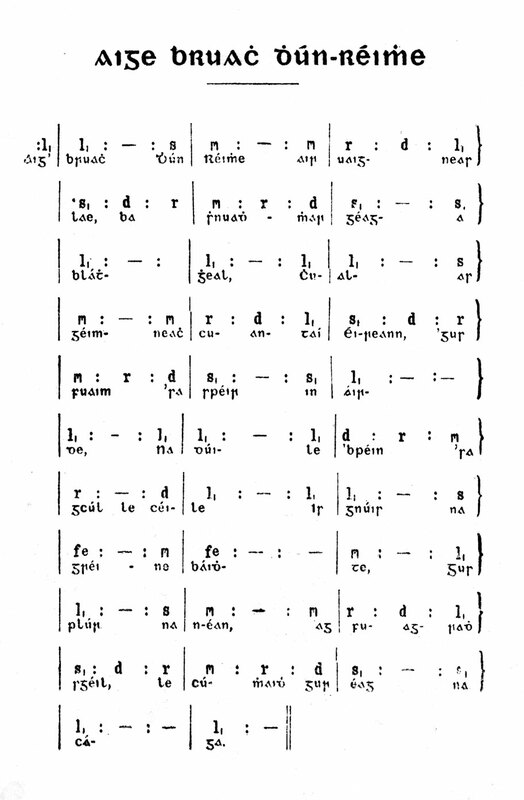 Ceiliúr an éin do b’áille. Gur scaoileadh an aolchloch álainn. Gurb ualach cré ’gus cnamha iad. Nó go dtiocfaidh sliocht Néill do d’ tharrtháil. A stór, mura n-éagfainn láimh leat. In sorrow that the crows had died. For the people of Ireland that day? Heaped up on the edge of the shore. To the friendly and laurelled place. The most beautiful bird as she sings. That the beautiful lime-walls are down. In a mound, they were clay and bones. Till Ó Néill’s tribe will come to your aid. My love if we die apart. 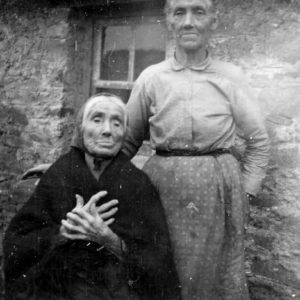 Aige Bruach Dhún Réimhe: Amhráin Chúige Uladh, 1927, 23– from Mary Harvessy in tonic solfa. It was later re-edited and published in staff notation bt Dr Colm Ó Baoill in Amhráin Chúige Uladh 1977. It is a splendid air in sonata form, with an effective use of the flattened 4th in the rise of the air.